My memories of the seventies are polluted with more than a few memories of dumb sixties era sitcoms and cowboy dramas run in syndication on cable TV, back when cable was new and had less than 100 channels. Gilligan’s Island, I Dream of Jeanie, The Brady Bunch, Gunsmoke – all the classics were available in the after-school hours to watch when our parents couldn’t figure out what else to do with us. But, among all this dross was one shining jewel, going boldly where no TV show had gone before: Star Trek. I never saw Star Trek when it was first run as a network series, only in syndication, when it had gained a certain cachet as nerdy touchstone for all those kids who weren’t cool enough to be part of the in crowd. Part of the appeal of Star Trek was the radical notion that there was hope for humankind, in the midst of a Cold War that could tear our world apart in an instant. The U.S. and the Soviet Union had their armies on high alert, and if a rogue plane crossed the trip wires, there would be little time to think as the ghastly procedures of nuclear war demanded instant reaction, not thoughtful response. To us nerds, this kind of instantaneous escalation of violence was all too familiar to us. For nerds like me, it seemed like the same bullies who beat the crap out of us for looking at them the wrong way were running our country. The politics of the time were just as polarized today, with the scars of the civil rights era and the Vietnam War still sore. Star Trek painted a different picture. Yes, there would still be warfare and weaponry, but the people wielding the weapons were given wise, logical counsel. Humanity had tempered its most bellicose tendencies with a forward thinking dose of rationalism, fairness, and unprejudiced acceptance of all beings, even those with pointy ears upturned eyebrows. And loyally serving on the bridge of the Enterprise was a Russian helmsman, and a black woman, Lt. Uhuru, played by the talented actress Nichelle Nichols. This was the kind of world we wanted to live in. 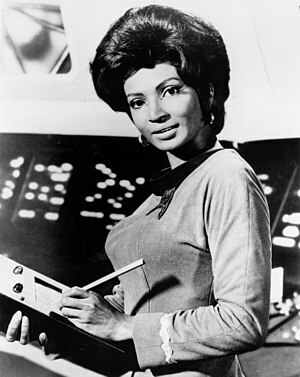 By the seventies, having a black actress in a leading role as competent, respected member of the crew was unusual, and certainly in the sixties Nichols’s role was groundbreaking. But I never understood completely how groundbreaking it was, until I read this recent story in Raleigh’s News & Observer, about Nichols meeting and conversation with Rev. Martin Luther King. Apparently, Nichols has retold this story with deserved pride many times over the years. So forgive me for posting old news, but for those of you aging Trekkies like me who hadn’t heard this story before, enjoy! This entry was posted in Personal and tagged Martin Luther King, Nichelle Nichols, postaweek2011, Star Trek. Bookmark the permalink. I’ve heard her tell this story, and I’ve watched her eyes when she did. Thanks for reminding me of it. My parents were big Trekkies when I was growing up, so I remember seeing all the reruns. I even fell asleep in one of the movies, though I don’t remember which one. It didn’t make sense to me at the time. I loved all the spin offs, and am glad we have a positive look at the future. This was the first I had heard of Nichols’ talking to Dr. Martin Luther King Jr. What a wonderful experience for her. Thanks for sharing.